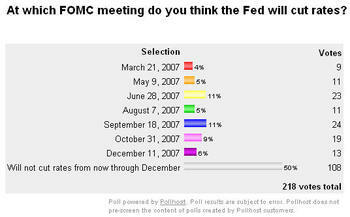 Earlier in the week, we asked readers if or when they thought the Fed would cut interest rates. As the results of the poll below show, almost exactly half of our readers didn't think the Fed would cut rates from now through December of this year. The rest of the results were spread pretty evenly, but the overall indication is that readers do not expect a rate cut anytime soon.